Painting by Wes Ostrander – Ostrander Family Association, Inc.
Depiction, Ostrander Family Reunion in the year 1715. Below find a letter written by Wes to OFA Members about this painting displayed at the 350th Anniversary OFA Reunion in 2011. 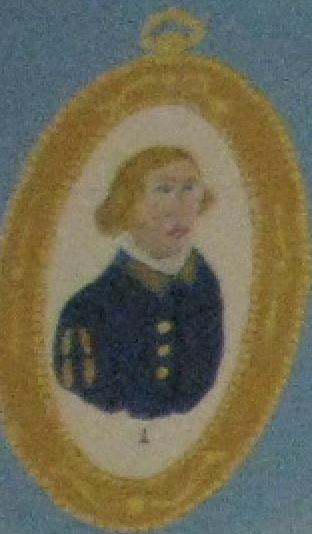 I have made a list of the 44 family and allied family members illustrated on the painting. Exceptions are 15APieter4 Ostrander (deceased) who is not illustrated but is accounted for in the chart at the bottom of the painting and is the oldest son of 15Johannes³ and 16Elizabeth van den Berg. 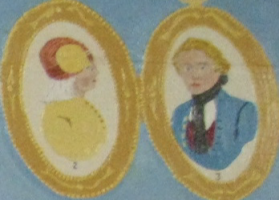 Maritje Suyland, the fiancée of 17Theunis³ Ostrander has been illustrated next to Theunis but without a number assigned. Following is a list of all the people illustrated on the painting; starting on the left and moving to the first head to the right is19Harmanus³ Ostrander. Yes, that’s him in a yellow jacket carrying a yoke on his shoulder. Upper Left -1: Pieter¹ Carstensen, our family progenitor, born c1605 on the island of Nordstrand off the coast of North Friesland, now Germany in the district of Schleswig- Holstein. He died in the year 1660 in the East Indies. Upper Right –2: Geesje¹ Jans, widow of Pieter¹ Carstensen. The gold discs on her headpiece are a status symbol of her culture in Oost Friesland. Upper Right -3: Arent¹ Teunissen Pier. No 3: Arent¹Teunissen Pier seems to me to be a most responsible figure in marrying Geesje¹ Jans with her two young children and starting a new life far off in New Amsterdam. Stepson Pieter² Pietersen (PP2) was only about three years old when they married and earned a place in Arent’s heart as they became very close in later years. We are finding out in recent public letters that they both tithed quantities of grain to the Dutch Church for the maintenance of the minister. No. –5: Pieter² Pietersen Ostrander in beige cloak at front corner of his house. No. –4: Wearing red: Joostje¹ Willemsen Traphagen wife of Willem¹ Traphagen deceased. No. 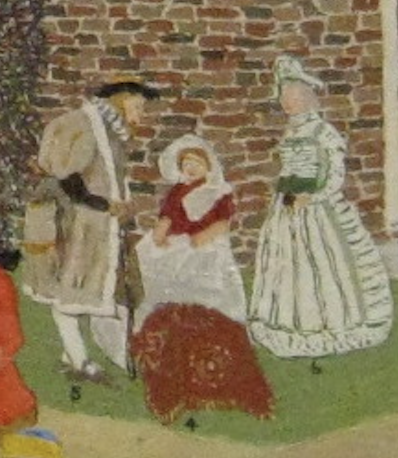 –6: Rebecca Traphagen in white dress with green trim, talking with her mother (No.4), wife of Pieter² Pietersen Ostrander. 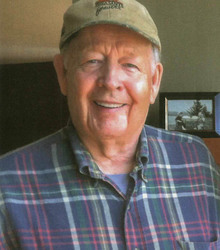 3C Wm.² Traphagen Jr., husband of Gepje Arents Pier and the brother of Rebecca Traphagen and founder of “The Oldest Inn in America” (in continuous service) the Beekman Arms in Rhinebeck, NY. In the early years, it was known as “Traphagen’s Tavern where travelers could seek the comfort of a night’s sleep under a wolf’s hide. 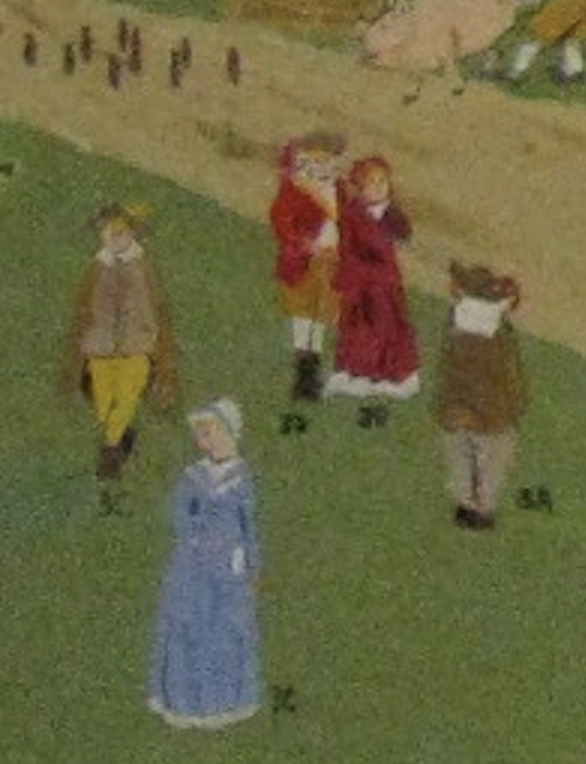 3C Gepje2 Arents Pier in blue dress, wife of Wm.2 Traphagen Jr.
3D Teunis2 Arentsen Pier in red coat with wife. His stone house may be seen in Rhinebeck, NY. 3D Margriet de Foer in red dress, wife of Teunis2 Arentsen Pier. 3A Herman2 Arentsen Pier in brown coat looking away. He is the first child of the union of Arent1 Teunissen and Geesje1 Jans and baptized after arrival in NewAmsterdam. No record of marriage. 18 Hendrick3 Ostrander with pig. 8A Adam4 Ostrander hunter w/bow and arrow, son of Pieter 3. 8C Petrus4 Ostrander in brown shirt, son of Pieter3. 3B Pieter2 Wini Jr. of Albany, husband of Janntje2 Arents Teunissen Pier. 3B Janntje2 Arents Pier in red jacket, daughter of Arent1 Teunissen Pier. 8B Rebecca4 Ostrander in white and pink dress, daughter of Pieter3. 14 Catrina3 Ostrander in blue dress. 8E Alida4 Ostrander, daughter of Pieter3, held by mother No.9. 9 Rachel Dingman in red dress, wife of Pieter3 Ostrander. 8 Pieter3 Ostrander in green jacket. 12A Petrus4 Ostrander in blue outfit, son of Arent3 Ostrander. 15 Johannes3 Ostrander in yellow shirt with back to wall. 13 Gertruy Maasen Bloemendaal in gray dress, wife of Arent3 Ostrander. 16 Elizabeth van den Berg with back to wall of house, wife of Johannes3. 12 Arent3 Ostrander, seated on bench in orange and owner of the home in back. 23 Jacob3 Ostrander, front and center with his geese following. 5 Pieter2 Pietersen Ostrander in beige cloak at front corner of his house on RH edge of paintng. 4 Joostje1 Willemsen Traphagen wife of Willem1 Traphagen deceased. 2 6 Rebecca Traphagen in white dress with green trim, talking with her mother (No.4), wife of Pieter Pietersen Ostrander. 22 Geesje3 Ostrander, blond hair with red ribbon. 7 Tryntje² Pieters Ploeg, sister of PP2, both children of Pieter¹ Carstensen. 12B Maas4 Ostrander, son of Arent³. 20 Leah³ Ostrander (twin), sitting on stoop. 15B Maria4 Ostrander, daughter of Johannes³. 10D Margriet4 Ostrander, daughter of Willem³. 8D Catrina4 Ostrander on stoop spinning wool, daughter of Pieter³. 10C Rebecca4 Ostrander in red dress, daughter of Willem3. 8F Willem4 Ostrander in cradle, son of Pieter3. 21 Rachel³ Ostrander (twin) in yellow/gold dress. Maritje Suyland, fiancee of Theunis³ Ostrander by RH corner of house. 17 Theunis³ Ostrander by RH corner of house. 11 Maritje de Hooges on arrival with her husband. 10A Pieter4 Ostrander, son of Willem3. 10B Johannes4 Ostrander, son of Willem3. L1 Sache Calcop of Ye Sopus, an Indian friend of the family joins in the visitation. I hope this will help you better understand the early years of the family’s development. Pieter¹ Cartensen’s 1st marriage to Tryntje Thyssen, in Amsterdam Feb. 1623. They had 12 children (1/2 brothers/sisters) Tryntje died 1650‐52. Second and third generation children are not shown. Tryntje² Peters, the older sister of PP2 married Hendrick Albertse Ploeg and had 12 children. Their 3rd and 4th generations are not shown. Arent¹ Teunissen Pier and Geesje¹ Jans had four children who are pictured, but their children or grand children are not. Editor note: For those of you who took detailed photos of the painting at the reunion, you can identify ancestors from this list.